Chet has felt those dark eyes on him for weeks, waiting for him to slip up, to give something away. But it's not Sheriff Weston's investigation that's getting to him, it's those eyes, and those hands, and the desire that's begun to consume every thought in his mind. When the Sheriff finally gets him in handcuffs, it could be Chet's last moment as a free man, or it could be the beginning of an entirely different kind of punishment. Either way, the Sheriff is going to open him up to feelings he never thought possible and teach him how young and stupid he really is. 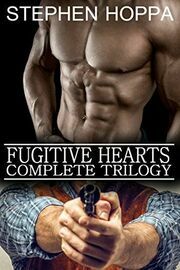 Chet has been on the run ever since Sheriff Weston let him get away with the robbery that should have landed him in prison. He could make a clean break if only he could stop thinking of the rough, angry cowboy who gave him his freedom. Even though he knows how stupid it is, he's prepared to risk going to prison just to spend one more night with the man who's touch he can't forget. Now the sheriff has to decide if he's going to let Chet go a second time, but not before giving him a punishment of his own. Chet thinks his life is over when he's finally caught for his crimes. But his sheriff won't let him go. He's arranged for Chet to be released on house arrest under his watch. Of course that doesn't mean he'll go unpunished and Chet has to face the question of why the sheriff wants him so bad that he'd risk more than his career for it.